Lisa's Most Coveted List: Bonus June Edition! Summer has arrived in Vancouver and I'm in such a good mood, I've decided to expand this edition of my Most Coveted List to include 7 things I'm loving right now; that's 40% more coveting than usual! 1. Wink Beauty Lounge. On the weekend, I attended Wink Beauty Lounge's La Dolce Vita event, a 3-day sale and celebration of Wink's one-year anniversary. I had more fun than usual shopping as I munched on a cupcake and sipped champagne. I like playing around with beauty products and experimenting with new colours (bright blue eyeshadow and coral nails anyone? ), but I'm not as much of a product junkie as my fellow shopping companion MizzJ, who loaded her wee plastic shopping basket with so many items that the handle broke off! The discounts and gifts with purchases made stocking up on some much needed beauty loot irresistible; I walked away with a few goodies. This was my first time at Wink, but the experience was so enjoyable I'll definitely be back--maybe next time I'll try one of their salon/spa services or spring for a set of lash extensions! Wink Beauty Lounge owner and lash extension queen Vivian Ko. Let's hear it for independent female business owners! 3. Instant miso soup. I go through phases where I become obsessed with a certain food and consume tons of it in a short space of time. At the moment it's instant miso soup. I bought a package of 12 single-serving packets at H-mart (a Korean supermarket) downtown and, my goodness, it really hits the spot after a long night of salsa dancing. 4. New dance shoes. My beloved Bloch ballroom shoes bit the dust this weekend. They literally fell apart--the insole on my right shoe ripped away from the shoe and flapped about like a loose tongue. Replacing my shoes so that I could keep salsa-ing was at the top of my to-do list, so I stopped by Limbers Dance Discount where, unbeknownst to me, they were having a clearance sale on their existing stock of ballroom shoes. The staff informed me that they might no longer carry ballroom shoes which really saddened me--I've been going to Limbers for dance shoes for the last few years. I bought the 'Annabella' in black and the 'Sienna' in beige because the prices were so good...I'm hoping I don't have to worry about replacing worn-out dance shoes for the next little while at least. 5. Home spa days. Lazy Sundays are scarce for me nowadays, but when I get the chance I love to do a home spa day. I give myself a mani and pedi (base coat, two coats colour, top coat), a facial, and read or watch a movie. It's so relaxing. Do you do anything similar? 6. Sunshine. Blog posts have been on-the-fly and shorter than usual lately because I'm busy outside soaking up the summer goodness and spending time with friends. 7. Froyo Swirl. 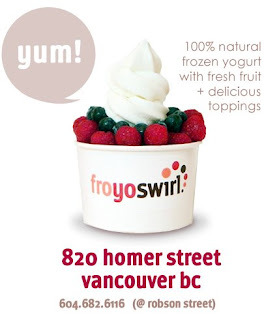 So, speaking of food fixations, I've developed a near-daily addiction to my local Froyo Swirl franchise, which is within walking distance of my office. Creamy frozen yogurt topped with tons of fruit...mmm I could go for some right now. Also, I just checked out their nutritional information and apparently the yogurt is fat-free and clocks in at a scant 25 calories per serving--a completely guilt-free indulgence. I wish I lived in Vancouver! These events sounds like so much fun! I don't ballroom dance but I'm tempted to get the shoes anyways. Looooove this post! Especially the fro-yo (yum!) 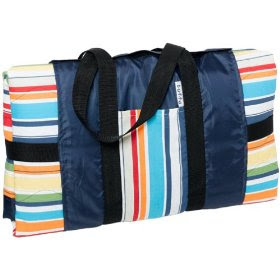 and the outdoor blanket ~ CC needs! I love miso soup, but I'm always hungry like 15 minutes after I eat it. I've always wanted to buy some ballroom dance shoes. Everytime i order new ballet slippers online those Freed dance shoes call out to me :). That event sounds like SO much fun. That's so funny that your friend busted the basket handle. I gotta get me one of those blankets. That's genius. And I'm so excited froyo is making a comeback. I <3 froyo!!! Home spa days sound amazing. That blanket is awesome! Totally getting one. Man, this post makes me hungry and makes me want to go shopping! Double whammy! The Bay Downtown Presents "Winter In Summer"